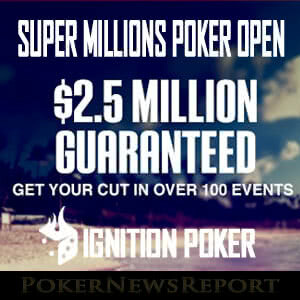 Ignition Poker has released the schedule for its $2.5 million guaranteed Super Millions Poker Open starting in just over two weeks on Saturday 15th July. Online poker players who enjoy their tournaments series are going to be spoilt for choice over the next few months. Americas Cardroom has announced there will be another OSS Cub3d series in August and 888Poker is rumoured to be putting together another Summer Championchips series for around the same time. However, before those two events get underway, Ignition Poker will be running its Super Millions Poker Open – a rehash of last year´s Summer Millions Poker Open, only with more events than last year, more variety in the schedule and more money up for grabs. The series is also a week longer than last year´s equivalent series. The Super Million Poker Open gets underway on Saturday 13th July with deepstack, superstack and knockout events, warming players up for a superb second day of the series which includes a heads-up event, a “Crazy Eights” event and a $110,000 guaranteed Sunday Special. 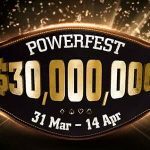 Overall there is nearly $250,000 in guaranteed prize money up for grabs over the opening weekend. The variety in the schedule kicks in from Monday, when the first of eighteen PLO or PLO Hi/Lo events takes place (there is also a Fixed Limit Omaha tournament scheduled for later in the series), plus some novelty NLHE events such as a full ring shootout, an ante-up knockout and a 6-Max hyper-turbo in which players start with 50,000 chips. 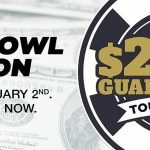 The highlights of the second weekend include another $110,000 guaranteed Sunday Special and the first of four “Thousandaire Maker” event – tournaments in which the payout structure is changed to reward the highest finishing players with $1,000 dollars each. The first half of the schedule concludes with a further Sunday Special and a $100,000 guaranteed High Rollers event on Sunday July 30th. The 105 events in the Super Millions Poker Open should include something for everyone. Buy-ins start from just $5.50, and satellites into the more valuable events start today at Ignition Poker from just $5.50. Please note that all of the events in the Super Millions Poker Open are single entry and, if you win multiple seats into the same event, only your first satellite victory will count. There is no option to exchange additional entries for cash or tournament tickets, so choose your satellites with care! Of course, you do not have to wait until July 15th to win big at Ignition Poker. 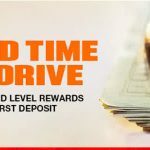 The site pays out more than $1.5 million each week in its regular tournament schedule, plus there is a highly competitive $100,000 guaranteed event each Sunday with a buy-in of $162.00. You could be cashing in at Ignition Poker while qualifying for events in the Super Millions Poker Open at the same time. So don´t delay, visit Ignition Poker today!